For about the last twenty years or so in Minnesota, it's been standard practice to seal up attic bypassses; little passageways for conditioned household air to leak in to the attic. Attic bypasses are also known as attic air leaks. 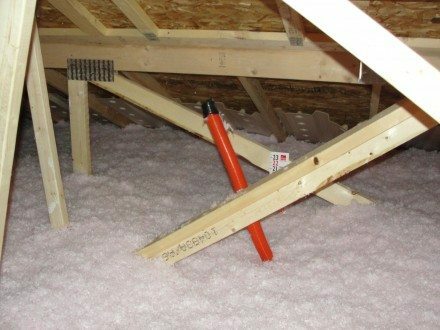 It's important to seal all of the bypasses in an attic, because air leaking in to an attic has a far greater effect on attic warming and heat loss than just missing insulation. 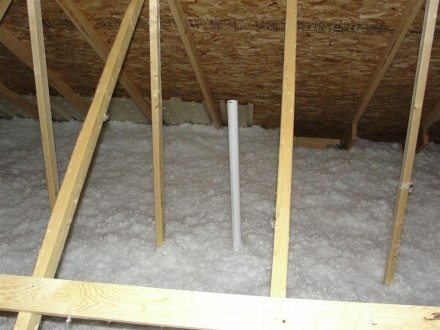 I've been doing a lot of new-construction inspections or one-year warranty inspections on new construction houses, and I've started to notice a new attic bypass that seems to be completely ignored by some builders and insulation contractors. 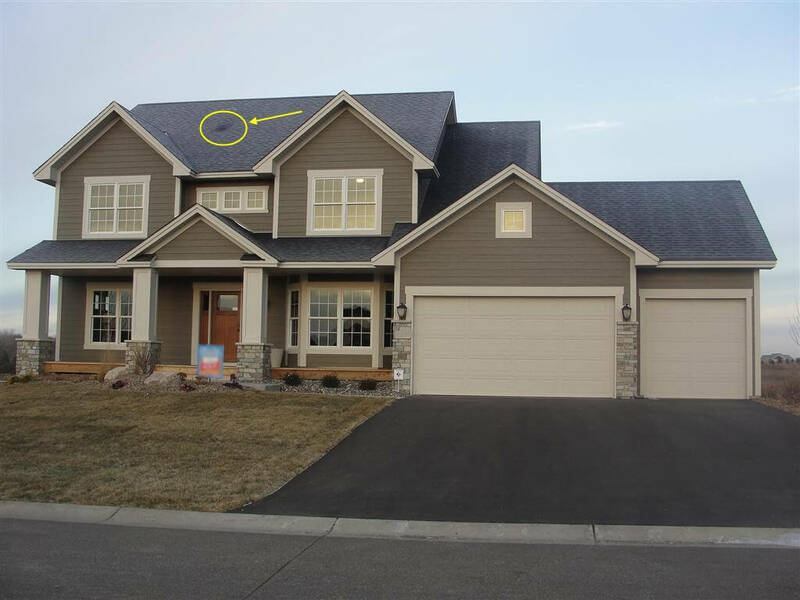 At a recent new construction inspection in Woodbury, I actually had a good suspicion that I would find this defect as soon as I pulled up to the house and looked at the frost covered roof. That dark spot on the roof shows a warm spot where the frost never accumulated. Click on the photo for a larger version. This localized warm spot on the roof is the result of a tube that was fed in to the attic as a chaseway for future wires, such as satellite cables or antenna cables. The other end of this tube is located in the basement utility room, near the data cable box - they call this a data tube or a tech tube, and I think it's a great idea. What better way to get low voltage wires from the basement to the attic? The only problem is that some installers seem to forget that this is another attic bypass that will leak warm air in to the attic. Just as every little hole and crack that allows air in to the attic needs to be sealed off, so does this relatively large opening. Thankfully, the fix for this situation is very simple; just cap the end of the pipe. This can be done pretty much any way you see fit - I've seen it done with both electrical tape and duct tape, and it works fine. 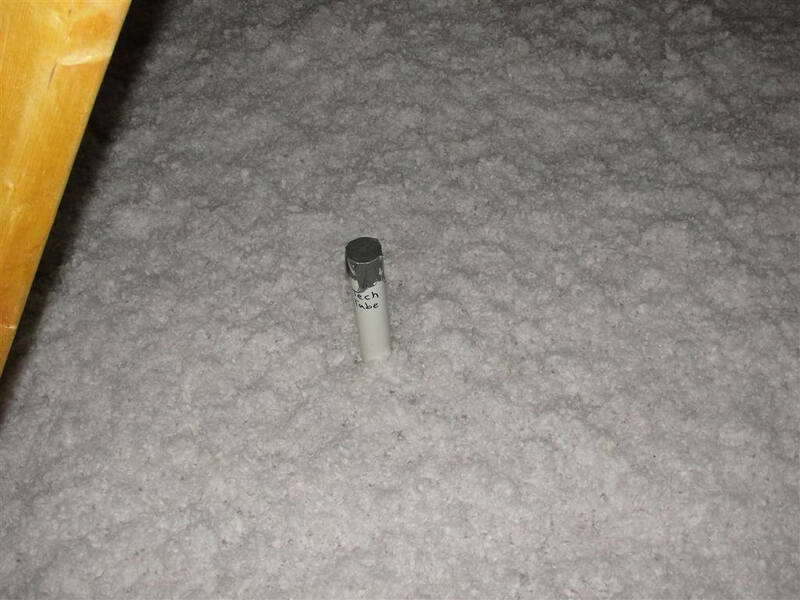 If you have a newer home, this is just one more reason to break the seal on your attic access panel.